Head louse Pediculus humanus capitis De Geer (Pediculidae: Phthiraptera) is a small and wingless insect with the body side of 2.5-4.5 mm. It is an ectoparasitic insect that feeds only on human blood more than three times per day. The most common symptoms of head lice infestation are red spots, irritation, pruritus of the scalp, and the secondary symptoms are sleep loss, blood loss, anemia and psychological distress,,,. Traditionally, pediculicides based on neurotoxic insecticides (lindane, malathion, carbaryl, permethrin and phenothrin) are the first option for head lice treatment. Unfortunately, head lice resistance to neurotoxic insecticides has occurred and been reported,,,. Moreover, adverse effects of chemical pediculicides such as irritation and burning sensation to the scalp, ataxia, tremor and seizure have been noted,. Presently, there are considerable concerns about chemical pediculicides related to human health, long chemical persistence in the environment, food supply, water, and air. Most importantly, head lice resistance to chemical pediculicides has already developed,,. Thus, new pediculicides for head lice treatment are needed. More than ten products based on plant extracts from neem, clove, henna, Zingiberacera plants, Piperaceae plants and essential oil from Zingiberacera plants, Rutaceae plants, eucalyptus, lavender, coconut and yalang-yalang have been tested as pediculicide for head lice treatment,,,,,,. Pediculicides from plants have been recommended as good and safe alternative pediculicides for head lice treatment because their toxicity to human’s nerve and respiratory systems is low,. Natural pediculicides from plants have been investigated for nymphicidal and adulticidal activities against head lice,,,,. Moreover, natural products are effective, easily biodegradable, inexpensive and environmental friendly, having no negative effects on non-target organisms,,. The chemical compounds from plant extracts and plant essential oils (EOs) exhibited an inhibition effect on acetylcholinesterase on the nervous system of insects and caused its paralysis and death,. Several papers published in 2004, 2008, 2016, and 2017 report that EOs from Eucalyptus globulus (E. globulus) leaves, Cinnamomum aromaticum bark, Eugenia aromatica flowering buds, Pimpinella anisum fruits, Sesamum indicum seeds, aerial parts of Mentha spicata and Thymus vulgaris were active against eggs and female adults of head lice,,,,. Shampoos of 10% crude aqueous extracts of Citrus aurantifolia and Citrus hystrix fruits exhibited highly effective pediculicidal activity against head lice. Mehlhorn et al and Al-Quraishy et al found that neem shampoo was highly toxic against eggs and adults of head lice. However, published papers related to ovicidal, nymphicidal and adulticidal acitivities of Cratoxylum formosum (C. formosum), Solanum trilobatum (S. trilobatum) and Moringa oleifera (M. oleifera) extracts against head lice are limited and many papers that reported about the Thai herbs presented in this study inform only of their therapeutic properties and health benefits but not of their pediculicidal activity against head lice,,,,,,. All Thai herbs investigated in this study are also used in traditional Thai medicine for treatment of food poisoning, diarrhea, internal bleeding, cough, and pyrexia and as expectorants. The major chemical constituents of C. formosum, S. trilobatum and M. oleifera extracts, EOs of E. globulus and Citrus sinensis (C. sinensis) were phenolic compounds and monoterpenes,,,,. Many papers have pointed out that monoterpenes cause mortality of insects by inhibiting the activity of acetylcholinesterase enzyme in the nervous system of insects,,,,. Therefore, the objective of this study was to determine the efficacies of new Thai herbal shampoos from C. formosum, S. trilobatum and M. oleifera added with either eucalyptus essential oil (eucalyptus EO) or citrus essential oil (citrus EO) as well as the efficacies of permethrin pediculicide (Scully Anti-Lice Shampoo®, 0.5% w/w permethrin) and drinking water (Kaesad®) against all stages of head lice: eggs, nymphs and adults. Freshly picked leaves of 5-year-old C. formosum trees, fresh fruits of one-year-old S. trilobatum trees and fresh fruits of five-year-old M. oleifera trees were collected from Nakhon-Ratchasima province, Thailand during the summer season, April-May, of 2016. All plant specimens were positively identified by a botanical taxonomist at the Faculty of Agricultural Technology, King Mongkut’s Institute Technology Ladkrabang (KMITL). Leaves and fruits of plants were cleaned, cut into small pieces, and put in a 5 L flask. One thousand grams of each plant was soaked in 2 000 mL of 95% ethyl alcohol at room temperature for 5 d. Crude extract was separated by suction filtered. Ethyl alcohol in the filtrate was evaporated with a rotary evaporator at 70 °C until a crude extract was achieved. Plant EOs of fresh leaves of five-year-old E. globulus trees (for eucalyptus EO) and fresh fruit peels of five-year-old C. sinensis trees (for citrus EO) were extracted by water distillation in a modified Clevenger type apparatus for 6-8 h. Water was removed from the extracts by using anhydrous sodium sulphate. All of the plant extracts and essential oils were used to prepare 6 Thai herbal shampoos at 10% concentration by a medical plant scientist at KMITL [1. C. formosum + eucalyptus EO shampoo (10% ethanolic extacts of C. formosum leaves + 10% E. globulus EO + water + emulsifier), 2. C. formosum + citrus EO shampoo (10% ethanolic extacts of C. formosum leaves + 10% C. sinensis EO + water + emulsifier), 3. M. oleifera + eucalyptus EO shampoo (10% ethanolic extacts of M. oleifera seeds + 10% E. globulus EO + water + emulsifier), 4. M. oleifera + citrus EO shampoo (10% ethanolic extacts of M. oleifera seeds + 10% C. sinensis EO + water + emulsifier), 5. S. trilobatum + eucalyptus EO shampoo (10% ethanolic extacts of S. trilobatum seeds + 10% E. globulus EO + water + emulsifier), 6. S. trilobatum + citrus EO shampoo (10% ethanolic extacts of S. trilobatum seeds + 10% C. sinensis EO + water + emulsifier)]. All plant shampoo were stored in the laboratory (25 °C and 70% RH). Permethrin pediculicide was used as positive control and drinking water as negative control. Permethrin shampoo (Scully Anti-Lice Shampoo®, 0.5% w/w permethrin) was manufactured by Sherwood Chemicals Manufacturing Co. Ltd, Chachoengsao province, Thailand, and drinking water (Kaesad®) was manufactured by the Faculty of Agroindustry King Mongkut’s Institute of Technology Ladkrabang, Bangkok, Thailand. (www.kmitl.ac.th/agrind). The protocol for collection of all stages of head lice from human beings was approved by the KMITL Ethic Committee, Ladkrabang, Bangkok, Thailand with a registration number of 2560-01-04-003 in May 2016. All stages of head lice were collected from the heads of 50 severely infested subjects who were students and parents of some students at several primary schools in Ladkrabang district, Bangkok, Thailand. Their hair was cut with scissors and put in small insect boxes (4 cm×7 cm×3 cm) for egg collection. Nymphs and adults were collected by using head lice combs. Each stage of head lice was separated under a stereomicroscope within 15-20 min after the collection. A filter paper contact method was used to evaluate the ovicidal, nymphicidal and adulticidal activities of six Thai herbal shampoos. Permethrin pediculicide and drinking water were used as positive and negative controls, respectively. Each shampoo at concentrations of 0.05, 0.10 and 0.20 mL/cm2 was dropped onto a 4.5-cm diameter filter paper. Ten fertile eggs/nymphs/adults of head lice were put in contact with it for 7 d (for eggs) and 5 min (for nymphs and adults). The eggs, nymphs and adults were incubated under laboratory conditions (25 °C and 70% RH). The control treatments with permethrin pediculicide (Scully shampoo®, 0.5% w/v permethrin) and drinking water were arranged concurrently with the treatments of Thai herbal shampoos. Each treatment was replicated five times. The mortality of eggs was recorded at 7 d and those of nymphs and adults were recorded at 5 min. The criterion for mortality of eggs was that either their operculum did not open or opened but the nymph inside was dead. The criterion for mortality of nymphs and adults was that all of their internal and external parts did not move ,,. Where NT is the total number of dead eggs/nymphs/adults and NC is the total number of treated eggs/nymphs/adults. 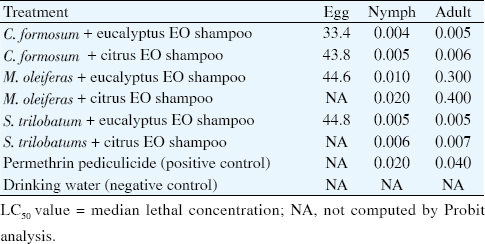 [Table 1] and [Table 2] showed the ovicidal, nymphicidal and adulticidal activities of Thai herbal shampoos at three concentrations (0.05, 0.10 and 0.20 mL/cm2) with eucalyptus and citrus EOs supplements in terms of mortality rate and LC50 values against eggs at 7-day exposure and against nymphs and adults at 5-min exposure. All Thai herbal shampoos exhibited strong activity against nymphs and adults of head lice but weak or no activity against eggs. All formulations of Thai herbal shampoo added with 10% eucalyptus EO showed more nymphicidal and adulticidal activities than those added with 10% citrus EO. All Thai herbal shampoos at high concentration (0.20 mL/cm2) effected high mortality rates. The 0.20 mL/cm2 of shampoos from C. formosum added with either 10% eucalyptus EO or 10% citrus EO effected mortality rates of 24.0%, 100% and 100.0% and 12.0%, 100% and 96.0% against eggs, nymphs and adults of head lice, respectively, while the 0.20 mL/cm2 of shampoo from S. trilobatum added with eucalyptus EO effected mortality rates of 12.0%, 100% and 100% against eggs, nymphs and adults of head lice, respectively. M. oleifera shampoo at all concentrations added either with eucalyptus EO or citrus EO effected mortality rates of 76.0%-100.0% and 68.0%-96.0% against nymphs and 20.0%-32.0% and 20.0%-30.0% against adults of head lice, respectively. On the other hand, S. trilobatum and M. oleifera shampoos added with citrus EO, permethrin pediculicide and drinking water did not show any ovicidal activity at all. Permethrin pediculide effected mortality rates of 68.0%-92.0% and 28.0%-60.0% against nymphs and adults, respectively. As expected, drinking water did not show any ovicidal, nymphicidal and adulticidal activities at all. 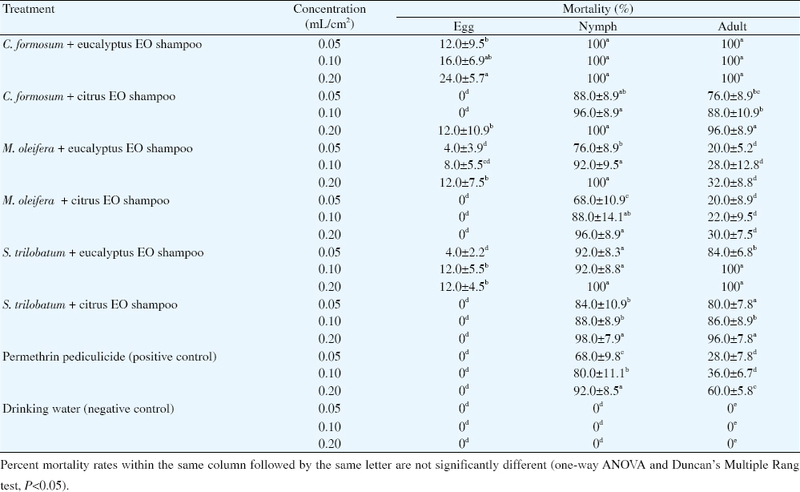 Table 1: Mortality rates of eggs at 7 d and those of nymphs and adults of P. humanus capitis at 5 min after applied with six formulations of Thai herbal shampoos, permethrin pediculicide and drinking water (mean± SD). Table 2: LC50 values of six formulations of Thai herbal shampoos, permethrin pediculicide and drinking water at 7 d against the eggs and at 5 min against nymphs and adults of P. humanus capitis (mL/cm2). All Thai herbal shampoos added with 10% eucalyptus EO were highly toxic to nymphs and adults with LC50 values of 0.0040-300 mL/cm2, while those added with 10% citrus EO showed LC50 values of 0.005-0.400 mL/cm2. The LC50 values of C. formosum, S. trilobatum and M. oleifera shampoos added with 10% eucalyptus EO against eggs of head lice were 33.4, 44.8 and 44.6 mL/cm2, respectively, and the LC50 value of C. formosum shampoo added with 10% citrus EO was 43.8 mL/cm2. The LC50 values of permethrin pediculicide against nymphs and adults were 0.020 and 0.040 mL/cm2, respectively. Drinking water did not show any LC50 value. The relationships between mortality rate (%) and concentrations (0.05, 0.10 and 0.20 mL/cm2) of six Thai herbal shampoos added with either 10% eucalyptus EO or 10% citrus EO against nymphs and adults of head lice showed that as concentration of Thai herbal shampoos increased from 0.05 to 0.20 mL/cm2, the mortality rate of nymphs and adults of head lice increased. The high concentration (0.2 mL/cm2) of all shampoo exhibited high mortality rate of all two stage of head lice. All Thai herbal shampoos added with eucalyptus EO were more effective against all head lice than those added with citrus EO. The nymphicidal and adulticidal activities of all formulation of C. formosum and S. trilobatum shampoos added with either 10% eucalyptus EO or 10% citrus EO at 0.20 mL/cm2 concentration were significantly higher than permethrin pediculicide (positive control) and drinking water (negative control) (P<0.05). All Thai herbal shampoos added with 10% eucalyptus EO at 0.05 mL/ cm2 concentration were more highly toxic to nymphs and adults of head lice than those added with 10% citrus EO. The maximum nymphicidal and adulticidal activities was 0.20 mL/cm2 from C. formosum shampoo added with 10% eucalyptus EO, which effected a mortality rate of 100% at 5 min against nymphs and adults and a mortality rate against head lice eggs of 24.0%. The results pointed that eucalyptus EO acted as a synergist agent in combination with C. formosum shampoo. Major chemical constituents of EO extracted from E. globulus were monoterpenoids, 1-8-cineole, α-terpinene, α - pinene, 2- β -pinene, β -myrcene, α -phellandrene, 1-isopropenyl-3-methylbenzene, γ- terpinene, (E)-pinocarveol and 1- α -terpineol,,. Many papers published in 2011, 2012 and 2013 reported that monoterpenoids from plant EOs caused mortality of insects by inhibiting the activity of acetylcholinesterase enzyme in the nervous system of the insects,, and monoterpenoids showed the highest activity against eggs and adults of head lice. Similarly, two papers published in 2011 and 2015 reported that an anti-louse shampoo which contained neem seed extract penetrated readily into the cuticle of eggs and adults of head lice and blocked their oxygen uptake, causing mortality,. Our results showed that C. formosum added with eucalyptus EO shampoo effected 100% mortality rate at 5 min against nymphs and adults of head lice. These shampoo might penetrate into the cuticle of nymphs and adults and inhibited their tracheae system, causing paralysis and death. In contrast, these shampoo showed inactivity against eggs of head lice with an inhibition rate of only 24.0% at 7 days of incubation,,. The cuticle of the eggs is very different from those of nymphs and adults. The cuticle of the eggs is hydrophobic and impervious to water,,. Since all Thai herbal shampoos tested in this study were aqueous formulation, they could not penetrate through the cuticle and showed low activity or inactivity against the eggs. All formulations of Thai herbal shampoo added with citrus EO tested in this study showed lower nymphicidal and adulticidal activities than those added with eucalyptus EO and S. trilobatum and M. oleifera shampoos added with citrus EO did not show any ovicidal activity at all. Major chemical constituents of C. sinensis EO are limonene, α -terpinene and α -pinene,. Similarly, two papers reported that limonene from plant EOs was low in activity against eggs and adults of head lice, and it was not very toxic to acetylcholinesterase enzyme in the nervous system of the insects,. On the other hand, α -pinene from C. sinensis EO exhibited high toxicity against Culex pipiens larvae. Even though published papers about ovicidal, nymphicidal and adulticidal acitivities of C. formosum, S. trilobatum and M. oleifera extracts against head lice are limited, but two papers published in 2009 and 2012 reported that extracts of M. oleifera seeds showed larvicidal, oviposition deterrent and ovicidal activities against two mosquito species, Aedes aegypti and Culex quinquefasciatus,,. Extracts of S. trilobatum leaves exhibited larvicidal and pupicidal activities against Aedes aegypti, Culex quinquefasiatus and Anopheles stephensi and an extract of C. formosum showed some therapeutic properties for humans such as antioxidant, anticancer, antimicrobial and anti-Alzheimer’s disease,. Our results showed that, all formulations of C. formosum and S. trilobatum shampoos added with eucalyptus EO at 0.05 and 0.10 mL/cm2 concentrations were more toxic to nymphs and adults of head lice than permethrin pediculicide (positive control; 68.0%- 80.0% mortality rate for nymphs and 28.0%-36.0% mortality rate for adults). On the other hand, permethrin pediculicide was more toxic to adults of head lice than all formulations of M. oleifera shampoos. All formulations of C. formosum and S. trilobatum shampoos at high concentration (0.20 mL/cm2) added with eucalyptus EO showed 12.0%-24.0% mortality rate of the eggs while permethrin pediculicide and all formulations of M. oleifera and S. trilobatum shampoos added with citrus EO did not show any ovicidal activity at all. Permethrin pediculicide was one of the most common pediculicides in Thailand for treatment of human pediculosis, but head lice resistance to it has caused treatment failure,,. Similarly, many papers reported that permethrin pediculicide showed 20%-30% mortality rate against nymphs and adults of head lice but did not kill eggs,,,. Therefore, in order for a permethrin treatment to be effective, it needs to be applied repeatedly 2-3 times per week and treated for 7-10 d after the 1st application,. Unfortunately, permethrin pediculicide is persistent, harmful and highly toxic to human beings because it is neurotoxic and head lice resistance to it can develop. Common adverse effects after treatment with permethrin pediculicide are pruritus, burning and erythema,,,,. For this reason, natural pediculicides derived from plant extracts are a more promising agent for head lice treatment. Our results showed that C. formosum + eucalyptus EO shampoo was highly effective pediculicide for killing two stage of head lice (nymphs and adults). The C. formosum + eucalyptus EO shampoo should not have any adverse effects to human beings since C. formosum has been edible for native Thai people for a long time and commonly used as traditional Thai herbal medicine for diarrhea, food poisoning, wound healing, cough, fever, and stomach ache,. The C. formosum + eucalyptus EO shampoo has a high potential for developing into new pediculicide for head lice treatment especially for infested Thai children whose head lice infestation rate was over 20%. C. formosum + eucalyptus EO shampoo is inexpensive and safe. However, it should be officially tested for acute and chronic toxicity before it is used as herbal pediculicide for head lice treatment. This work was supported by King Mongkut’s Institute of Technology Ladkrabang (KMITL), Bangkok, Thailand for academic year 2015/2016, Grant No. KMITL 2560-01-04-003, and the National Research Council of Thailand (NRCT) (Thesis Grant for Doctoral Degree Student Fly 2016). We wish to thank the botanical taxonomist and entomologist at KMITL for their identification of plants and insects. We also wish to express our gratitude to Mr. Pratana Kangsadal, the KMITL Proofreader, for reviewing and giving comments on the manuscript. Sangare AK, Doumbo OK, Raoult D. Management and treatment of human lice. Bio Med Res Inter 2016; 2016(2): 1-12. Meister L, Ochsendorf F. Head lice. Dtsch Arztebl Int 2016; 113: 763-772. Walker C, Sebastian R, Krishna S, Tobias JD. A lousy reason for surgery cancellations. Clin Pediatr (Phila) 2016; 55(8): 707-711. Durand R, Bouvresse S, Berdjane Z, Izri A, Chosidow O, Clark JM. Insecticide resistance in head lice: clinical, parasitological and genetic aspects. Clin Microbiol Infect 2012; 18(4): 338-344. Feldmeler H. Pediculosis capitis: new insights into epidemiology, diagnosis and treatment. Eur J Clin Microbiol Infect Dis 2012; 31(9): 2105-2115. Wadowski L, Balasuriya L, Price HN, O’Haver J. Lice update: new solutions to an old problem. Clin Dermatol 2015; 33(3): 347-354. Devore CD, Schutze GE. Head lice. Pediatrics 2015; 135: e1355-1365. Clark JM, Yoon KS, Lee SH, Pittendrigh BR. Human lice: past, present and future control. Pest Biochem Physiol 2013; 106(3): 162-171. Abdel-Ghaffar F, Abdel-Aty M, Rizk I, Al-Quraishy S, Semmler M, Gestmann F, et al. Head lice in progress: what could/should be done-a report on an in vivo and in vitro field study. Parasitol Res 2016; 115(11): 4245-4249. Watcharawit R, Soonwera M. Pediculicidal effect of herbal shampoo against Pediculus humanus capitis in vitro. Trop Biomed 2013; 30(2): 315-324. Soonwera M. Pediculicidal activities of herbal shampoo from Zingiber officinale Roscoe and Camellia sinensis (L.) Kuntze against head louse (Pediculus humanus capitis De Geer: Phthiraptera). J Agri Tech 2015; 11(7): 1493-1502. Soonwera M. Toxicity of five herbal extracts against head louse (Pediculus humanus capits De Geer: Phthiraptera). J Agri Tech 2016; 12(4): 657-666. Soonwera M. Efficacy of herbal shampoo base on native plant against head lice (Pediculus humanus capitis De Geer; Pediculidae: Phthiraptera) in vitro and in vivo in Thailand. Parasitol Res 2014; 113(9): 3241-3250. Soonwera M. Herbal pediculicides base on Alpinia galangal (L.) Willd (Zingiberaceae) and Syzygium aromaticum (L.) Merrill& Perry (Myrtaceae) against head louse (Pediculus humanus capitis De Geer; Pediculidae). J Agri Tech 2015; 11(7): 1503-1513. Bagavan A, Rahuman AA, Kamaraj C, Elango G, Zahir AA, Jayaseelan C, et al. Contact and fumigant toxicity of hexane flower bud extract of Syzygium aromaticum and its compounds against Pediculus humanus capitis (Phthiraptera: Pediculidae). Parasitol Res 2011; 109(5): 1329-1340. George DR, Finn RD, Graham KM, Sparagano OA. Present and future potential of plant-derived products to control arthropods of veterinary and medical significance. Parasit Vectors 2014; 7(1): 1-12. Rahman JU, Ali A, Khan IA. Plant base products: use and development as repellents against mosquitoes: A review. Fitoterapia 2014; 95(10): 65-74. Ebadollahi A. Iranian plant essential oils as sources of natural insecticide agents. Int J Biol Chem 2011; 5(5): 266-290. Regnault-Roger C, Vincent C, Arnason JT. Essential oils in insect control: low-risk products in a high-stakes world. Annu Rev Entomol 2012; 57(57): 405-424. Agra-Neto AC, Napoleão TH, Pontual EV, Santos ND, Luz Lde A, de Oliveira CM, et al. Effect of Moringa oleifera lectins on survivals enzyme activities of Aedes aegypti larvae susceptible and resistant to organophosphate. Parasitol Res 2014; 113(1): 175-184. Yingngam B, Supaka N, Rungseevijitprapa W. Optimization of process parameters for phenolics extraction of Cratoxylum formosum ssp. formosum leaves by response surface methodology. J Food Sci Technol 2015; 52(1): 129-140. Yingngam B, Monschein M, Brantner A. Ultrasound-assisted extraction of phenolic compounds from Cratoxylum formosum ssp. formosum leaves using central composite design and evaluation of its protective ability against H2O2-induced cell death. Asian Pac J Trop Med 2014; 7S1: S497-505. Sahu J, Rathi B, Koul S, Khosa RL. Solanum trilobatum (Solanaceae)- an overview. J Nat Remed 2013; 13(2): 76-80. Barbosa LC, Filomeno CA, Teixeira RR. Chemical variability and biological activities of Eucalyptus spp. essential oils. Molecules 2016; 21(12): 1-33. Yones DA, Bakir HY, Bayoumi SAL. Chemical composition and efficacy of some selected plant oils against Pediculus humanus capitis in vitro. Parasitol Res 2016; 115(8): 3209-3218. Gutierrez MM, Werdin-Gonzalez JO, Stefanazzi N, Bras C, Ferroro AA. The potential application of plant essential oils to control Pediculus humanus capitis (Anoplura: Pediculidae). Parasitol Res 2016; 115(2): 633-641. Toloza A, Lucia A, Zerba E, Masuh H, Picollo MI. Interspecific hybridization of Eucalyptus as a potential tool to improve the bioactivity of Eos against permethrin-resistant head lice from Argentina. Bioresour Technol 2008; 99(15): 7341-7347. Greive KA, Barnes TM. The efficacy of Australian essential oils for the treatment of head lice infestation in children: a randomized controlled trial. Australas J Dermatol 2017. Doi: 10.1111/ajd.12626. Toloza AC, Lucia A, Zerba E, Masuh H, Picollo MI. Eucalyptus essential oil toxicity against permethrin-resistant Pediculus humanus capitis (Phthiraptera: Pediculidae). Parasitol Res 2010; 106(2): 449-414. Mehlhorn H, Abdel-Ghaffar F, Al-Rasheid KAS, Schmidt J, Semmler M. Ovicidal effects of neem seed extract preparation on eggs of body and head lice. Parasitol Res 2011; 109(5): 1299-1302. Al-Quraishy S, Abdel-Ghaffar F, Mehlhorn H. Head louse control by suffocation to due to blocking their oxygen uptake. Parasitol Res 2015; 114(8): 3105-3110. Dechakhamphu A, Wongchum N. Screening for anti-pancreatic lipase properties of 28 traditional Thai medicinal herbs. Asian Pac J Trop Biomed 2015; 5(12): 1042-1045. Laphookhieo S, Maneerat W, Koysomboon S. Antimalarial and cytotoxic phenolic compounds from Cratoxylum maingayi and Cratoxylum cochinchinense. Molecules 2009; 14(4): 1389-1395. Kuvatanasuchati J, Laphookhieo S, Rodanant P. Antimicrobial activity against periodontopathic bacteria and cytotoxic study of Cratoxylum formosum and Clausena lansium. J Med Plants Res 2011; 5(25): 5988-5992. Ragasa C, Ng VAS, Shen CC. Chemical constituents of Moringa oleifera Lam. seeds. Int J Pharm Phytochem Res 2016; 8(3): 495-498. Chumark P, Khunawat P, Sanvarinda Y, Phornchirasilp S, Morales PN, Phivthong-ngam L, et al. The in vitro and ex vivo antioxidant properties, hydolipidaemic and antiatherosclerotic activities of water extract of Moringa oleifera Lam. leaves. J Ethnopharmacol 2008; 116(3): 439-446. Amabye TG. Chemical compositions and nutritional value of Moringa oleifera available in the market of Mekelle. J Food Nutr Sci 2015; 3(5): 187-190. Thongpraditchote S, Hanchanga W, Wongkrajang Y, Temsiririrkkul R, Atisuk K. Toxicological evaluation of Solanum trilobatum L. fruits. Mahidol U J Pharma Sci 2014; 41(4): 39-46. Ghaffar A, Yameen M, Kiran S, Kamal S, Jalal F, Munir B, et al. Chemical composition and in-vitro evaluation of the antimicrobial and antioxidant activities of essential oils extracted from seven Eucalyptus species. Molecules 2015; 20(11): 20487-20498. Russo S, Cabrera N, Chludil H, Yaber-Grass M, Leicach S. Insecticidal activity of young and mature leaves essential oil from Eucalyptus globulus Labill. against Tribolium confusum Jacquelin du Val (Coleoptera: Tenebrionidae). Chilean J Agri Res 2015; 75(3): 375-379. Grewick BC, Spark TC. Natural products for pest control: An analysis of their role, value and future. Pest Manag Sci 2014; 70(8): 1169-1185. Priestley C, Burgess I, Williamson E. Lethality of essential oil constituents towards the human louse, Pediculus humanus, and its eggs. Fitoterapia 2006; 77(4): 303-309. Waikedre J, Dugay A, Barrachina I, Herrenknecht C, Cabalion P, Fournet A. Chemical composition and antimicrobial activity of the essential oils from new Caledonian Citrus macroptera and Citrus hystrix. Chem Biodivers 2010; 7(4): 871-877. Verzerza A, Trozzi A, Dugo G , Di Bella G, Cotroneo A. Biological lemon and sweet orange essential oils composition. Flav Fragran J 2004; 19(6): 544-548. Michaelakis A, Papachristos D, Kimbaris A, Koliopoulos G, Giatropoulos A, Polissiou MG. Citrus essential oils and four enantiomeric pinenes against Culex pipiens (Diptera: Culicidae) Parasitol Res 2009; 105(3): 769-773. Ferreira PM, Carvalho AF, Farias DF, Cariolano NG, Melo VM, Queiroz MG, et al. Larvicidal activity of the water extract of Moringa oleifera seeds against Aedes aegypti and its toxicity upon laboratory animals. An Acad Bras Cienc 2009; 81(2): 207-216. Santos NDL, Moura KS, Napoleao TH, Santos N, Coelho LCBB, Navarro F, et al. Oviposition-stimulant and ovicidal activities of Moringa oleifera lectin on Aedes aegypti. PLOS One 2012; 7: e44840. Doi:10.1371/journal.pone.0044840. Ashfaq M, Ashfaq U. Evaluation of mosquitocidal activity of water extract of Maringa oleifera seeds against Culex quinquefasciatus (Diptera: Culicidae) in Pakistan. Pak Ento 2012; 34: 21-26. Permalatha S, Elumalai K, Jeyasankar A. Mosquitocidal properties of Solanum trilobatum leaf extracts against three important human vector mosquitoes (Diptera: Culicidae). Asian Pac J Trop Med 2013; 6(11): 854-858. Keowkase R, Weerapreeyakul N. Cratoxylum formosum extract protects against amyloid-beta toxicity in a Caenorhabditis elegans model of Alzheimer’s disease. Planta Med 2016; 82(6): 516-523. Suddhasthira T, Thaweboon S, Dendoung N, Thaweboon B, Dechkunakorn S. Antimicrobial activity of Cratoxylum formosum on Streptococcus mutans. Southeast Asian J Trop Med Public Health 2006; 37(6): 1156-1159. Lebwohl M, Clark L, Levitt J. Therapy for head lice based on life cycle, resistance, and safety considerations. Pediatrics 2007; 119(5): 965-974. Eisenhower C, Ferrington EA. Advancements in the treatment of head lice in pediatrics. J Pedriatr Health Care 2012; 26(6): 451-461. Rassami W, Soonwera M. Epidimiology of pediculosis capitis among schoolchildren in the eastern area of Bangkok, Thailand. Asian Pac J Trop Biomed 2012; 2(11): 901-904.